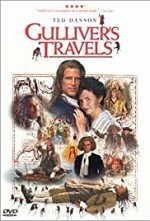 Watch Gulliver's Travels: All star adaptation of Jonathan Swift's satirical tale about a normal man who, after returning home following eight years of absence, relates fantastical tales about how he was thought to be giant in the Land of Lilliput, but was only six inches high in the Land of Brobdingnag. He also tells of his visit to the floating island of Laputa populated by scientists who are so obsessed with reason that they act with no common sense. Finally, he tells of his journey to the land where his disturbing likeness to the bestial Yahoos and his inferiority to the intelligent horses there makes him question the very worth of his humanity.